While moose are generally perceived to be less dangerous than bears, more people in Alaska are injured by moose than by bears each year. Moose will usually flee when threatened but under certain circumstances, they can become aggressive. People can be hurt when moose charge, stomp and kick to protect themselves or their young. Understanding a moose's body language when stressed, can help you stay safe. Do you know what to do when a moose charges? Fortunately most moose charges are bluffs — warning you to stay back. But if a moose does charge, don't wait to find out if it's bluffing. Run and get behind something solid, like a tree, or retreat to a safe place, like inside a building or car. Why are moose aggressive towards humans? Moose are not normally aggressive; however, they can become aggressive when they are harassed by people, dogs, and traffic, or when hungry and tired, especially in winter when they must walk through deep snow. Sometimes people throw snowballs at moose or approach them too closely for safety. Dogs can surprise moose in backyards, and loose dogs may chase or bark at them. Moose view dogs as enemies and will sometimes go out of their way to kick at one, even if the dog is on a leash or in a fenced yard. Give moose an extremely wide berth if you have a dog with you and don't let your dog chase a moose. When moose are on a road, driveway, or trail or when they are lying under a deck or up against a house, they are often trying to rest. 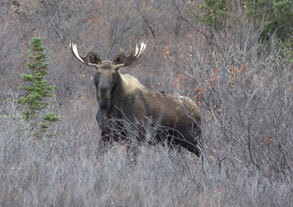 When people repeatedly approach them or chase them away, moose become stressed and agitated. Each moose has a different tolerance level, but if they are harassed enough, many moose will respond aggressively. Are there other seasons when moose tend to be aggressive? During the fall mating season in late September and October, termed the rut, bull moose may be aggressive toward humans. 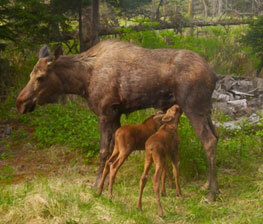 In late spring and summer, cow moose with young calves are very protective and will attack humans who come too close. If you see a calf on its own, be very careful because you may have walked between it and its mother — a very dangerous place to be. Is it okay to feed moose? No. It is illegal and dangerous. Moose that are fed by humans often become conditioned and will act aggressively when they are not fed as expected. A moose with a history of being fed may approach an unsuspecting person in hopes of receiving a hand-out. It may attack if it sees that the person has no food to offer. Don't feed moose and ask your neighbors not to feed them. If your neighborhood moose is fed by humans, chances it will charge people, including children, increase. A moose with a history of unprovoked attacks will likely be shot by enforcement officers to protect public safety. Therefore, by feeding a moose, people are more likely contributing to its death rather than its benefit. How do you know when a moose might attack? The long hairs on its hump are raised, ears laid back (much like a dog or cat), and it may lick its lips (if you can see this, you are way too close). A moose that sees you and walks slowly towards you is not trying to be your friend; it may be looking for a hand-out or warning you to keep away. All of these are dangerous situations and you should back away. Look for the nearest tree, fence, building, car, or other obstruction to duck behind. What if a moose is obstructing my way? Is there another way around the moose? If not, be patient. The moose will move away in time. It may take half an hour or more, but it is usually worth waiting. Sometimes a loud noise or movement will startle a moose into moving, but moose that are used to people are not easily chased away. If you have to get by, try to keep a large tree, snow berm, vehicle, building, or fence between you and the moose. Don't approach a moose if its only escape route is in your direction, and always leave yourself one or more escape routes. As a last resort, pepper spray will often move them, or at least provide some protection if they charge. Frequently, unsuspecting dogs are let out in their backyards when lighting is poor resulting in a surprised moose and a surprised dog. Turn outside lights on and scan your yard before blindly releasing your four-legged friend into the darkness. What if a moose charges? Many charges are "bluff" charges, warning you to stay back and keep your distance. However, you need to take them seriously. Even a calf, which weighs 300 or 400 pounds by its first winter, can cause serious injury. When a moose charges it often kicks forward with its front hooves. Unlike with bears or even dogs, it is usually a good idea to run from a moose because they won't chase you very far. Get behind something solid; you can run around a tree faster than a moose. If it knocks you down, a moose may continue running or start stomping and kicking with all four feet. Curl up in a ball, protect your head with your hands, and hold still. Don't move or try to get up until the moose moves a safe distance away or it may renew its attack. Are kids safe around moose? Yes, usually. The problem is both kids and moose are somewhat unpredictable. Young kids will take cues from adults: if you take a chance, they might also. Keep kids away from moose. If a moose is hanging out at a school bus stop, ask the driver to pick the kids up one or two blocks away. Establish a parent patrol to wait at the bus stop with the kids. If your kids walk to school, show them another way to walk if they see a moose on their normal route. If you know a moose is in your neighborhood, kids should avoid walking through the woods where it is dark and there is no easy escape should the moose be encountered. For information on staying safe around moose, especially for young Alaskans, see Wildlife Safety. A 12-minute video on safety around urban moose, produced by ADF&G and middle school students at Mirror Lake School. Target audience is third-fifth graders.